Art Docent Apparel On Sale Now! 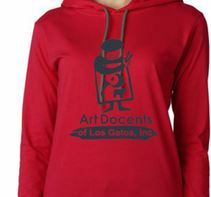 Now is your chance to purchase Art Docent Logo Clothing! Former Art Docent and Los Gatos business owner, Heidi Rehbock has created a flirty and fashionable line of clothing that can be customized for the Art Docents. A portion of each sale will be donated to the Art Docents. Heidi specializes in youth sports providing teams, leagues, schools and youth organizations with uniforms, equipment, custom apparel and fan gear. She also provides apparel and other promotional marketing items to organizations outside of the sports arena. Stop by the Art Docent office to see the clothing and place your order. Or click here to go the website to order online.